Spellblogger Sneak Peak – Die D-Lites The Copic Book goes to…. Hello and welcome to Day 3 of our October Rubber & Die Release Showcase! On Wednesday (24 October) Whimsy Stamps released this month’s new rubber designs, Shapeology dies, Whimsy Designer Paper packs and Shape EZ templates. From then until 30 October the Whimsy Stamps DT and Special Guests are showcasing these fabulous new goodies with a daily mini blog hop! To be entered into today’s mini blog hop prize draw, be sure to leave a comment on ALL of the DT’s posts listed below by 12.00PM EST tomorrow. All winners will be announced on the Whimsy blog on 31 October. 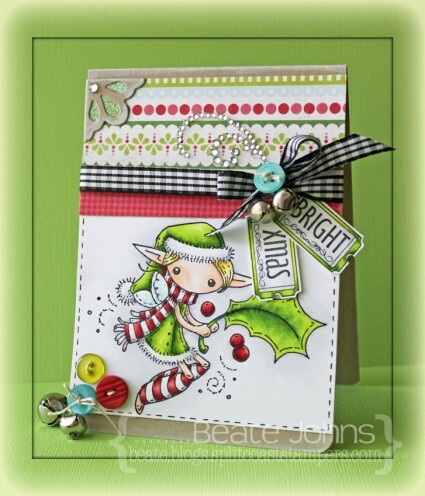 For my card today I used this super cute Meljen’s Designs Holly Christmas Fairy. She was stamped in Tuxedo Black Memento Ink on Neenah Solar White cardstock . It was colored with Copic Markers (Reds: R32, R35, R37, R39 Greens: YG01, YG03, YG17 Skin: E0000, E00, E01 Hair: Y11, Y13, E31 Wings: BG000, BG10 Background: C00, C1, BV00). The wings were covered with Stardust Stickles and a faux stitched border added with a Copic Multiliner. The card base is a 4 1/4″ x 11″ piece of Kraft cardstock folded in half. The edges were inked with Moonlight Brilliance ink and the bottom corners of the card were rounded. Three buttons were stitched to the bottom right corner of the image layer before it was adhered to the lower half of the card. Two pieces of Carta Bella’s Merry & Bright patterned paper were adhered above each other . Black Gingham ribbon was tied around them before they were adhered to the card base. The ribbon bow was topped with a button and two little bells were tied underneath. Two tickets from the new Holiday Mini Tickets were stamped in Tuxedo Black ink on white cardstock, colored with Copic Markers and cut out. The sentiments were adhered underneath the bow. Kraft cardstock was cut with a Corner die. The edges were sponged with Moonlight white ink and green Carta Bella paper was adhered underneath. Glitter was adhered over the openings. A rhinestones from Sleek Strips Silver Rhinestones was adhered on the top corner of the corner die. Part of a Finesse Rhinestone swirl above the bow finish off the card. Fantastic Bright card! I love all of your embellishments and your coloring. thanks for sharing. 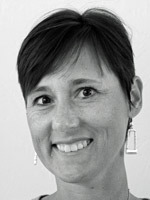 Beautiful Beate! I love this little Meljen’s Fairy! The colors you chose are perfect once again!! Love it! Love the bright colours and the buttons Beate,great card! This card is stunning and so sweet. I love to see your coloring and how you put your cards together. I love your explanations too!! Thanks for sharing. What a gorgeous card – totally adore these cute stamps. This is seriously adorable Beate! I love that image and I adore the layout you made with the colors and textures at the top… gorgeous! Gorgeous card, Beate! Love the bright papers and cute image! Fantastic coloring and details! Gorgeous card with fab colouring of that sweet image! Awwww so gorgeous! I love the cute image and the fabulous papers. The ribbon and bell design is so beautiful too. thanks for the inspiration. This is so cute and fun! Simply adorable! Great card and this is such a cute image and thanks for giving the copic no used. So cute! Love the buttons, bells, tickets, image………. Darling little elf and such a joyful card! Just found your blog through the Whimsy Blog Hop and am in awe of your beautiful creations. Absolutely adore this card with its perfect seasonal colouring. THanks for sharing. Oh my cuteness!! I love the traditional red and green colors. Great embellishments. Awesome card. Very cute card, awsome coloring. This is so adorable. I love the gingham ribbon and the image is so cute. Sweet card and image…love the papers and button detail. Sweet little image, great coloring and embellishments. very cute, love the ticket sentiment and the bells with the ribbon and button!! Oh my your colouring is spot on Beate! That Elf is so cute! What a clever card! So pretty! Have a great week and thanks for the hop! Such a precious little holiday fairy on a beautiful card! Love this! From the cute image, to pretty papers, to the embellishing! I need to find my bag of little jingle bells in my craft stash! LOL!